I really am not sure what has been going on in life. It has been seriously crazy. I am beginning to feel as if the moon is at a constant full state around here. We wrapped up the book we were reading in Bible study. I try to always write a summary of the current chapter. This one was a bit more difficult. Not because it was a hard chapter, but it was saying goodbye to a friend. This was the summary I wrote up today. 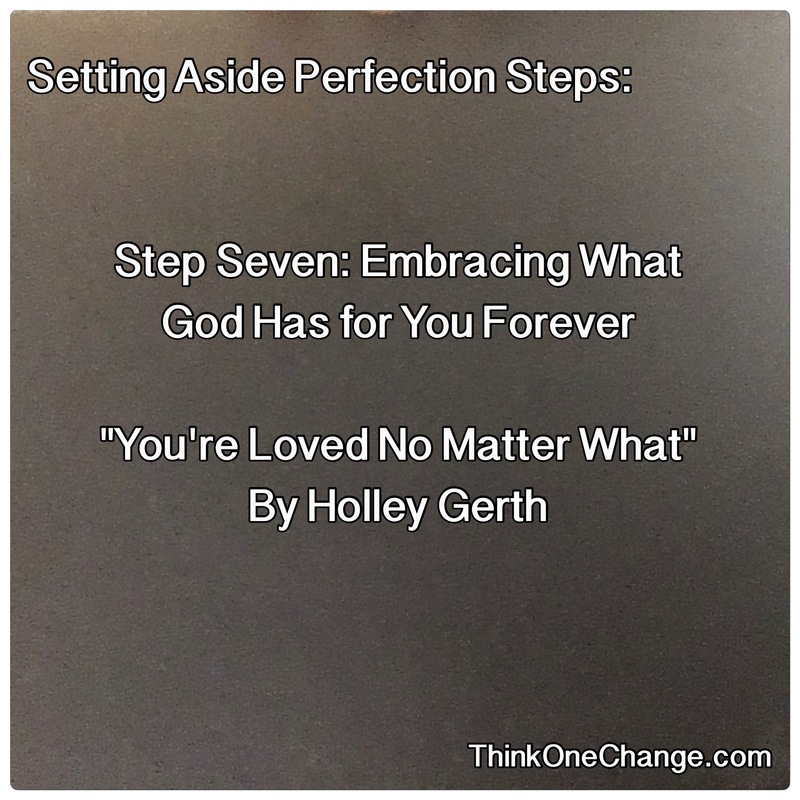 Yesterday we finished the book “You’re loved no matter what” By Holley Gerth. I learned so much from this book. A lot of it went along with a book we did over the summer and it seems to be continuing into another book I am reading as well. I am thinking I have more perfection to let go of than I thought! 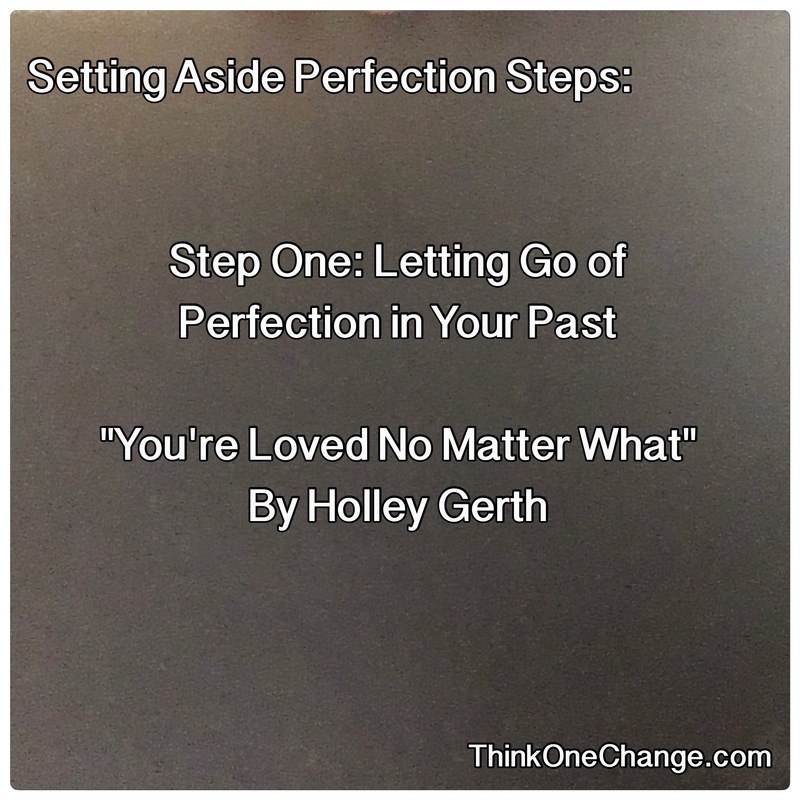 Step One: Letting go of perfection in your past. ~We are all human, we are all covered by God’s grace. Yes, all of us have been hurt by others. Who am I to say if those who hurt me were not hurt by me as well. God’s grace has covered all of us. Give God those you are holding hostage in your heart. God wants you to have the peace He died for. 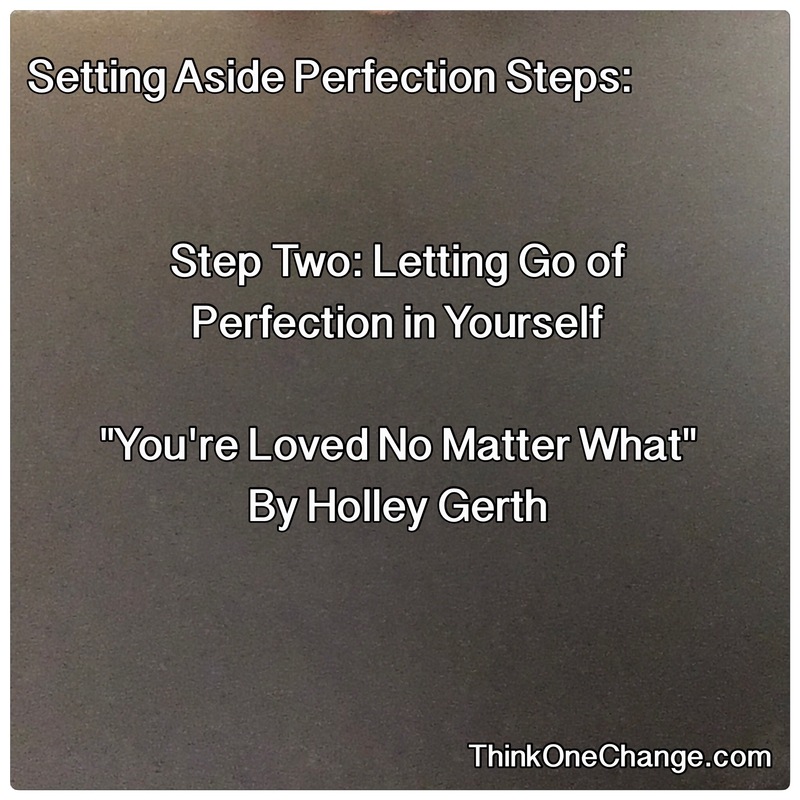 Step Two: Letting go of perfection in yourself. ~We are typically harder on ourselves than anyone else. When you want to criticize yourself for anything, look at yourself through His eyes. Pray that you are released from your binding thoughts and He replace your thoughts with His truth. 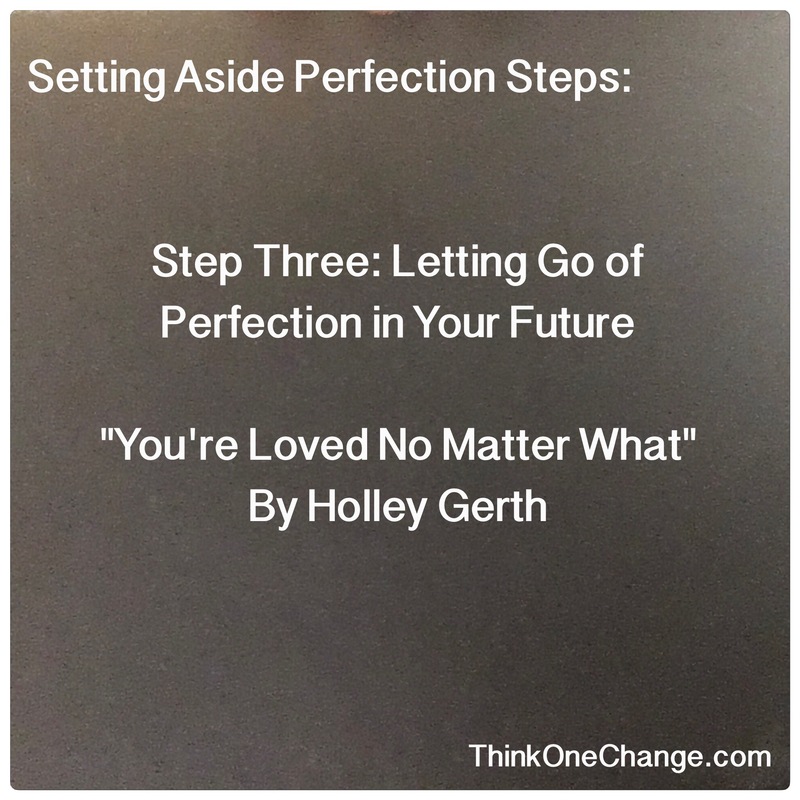 Step Three: Letting go of perfection in your future. ~So often I used to worry about what the future would hold. All it was for me, wasted time. Focus on today. Spend your time with Him instead of letting yourself be full of anxiety about what is to come. When you are focusing on God and your relationship with Him, we release the control back to who has always had it. 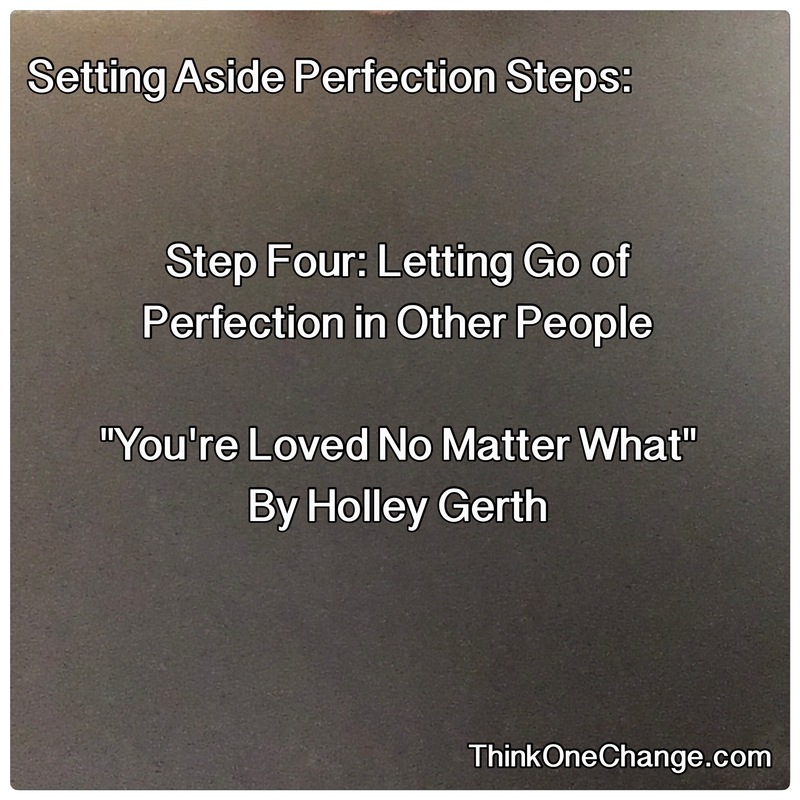 Step Four: Letting go of perfection in other people. ~For a long time I wanted to change others. Then while trying to save my 1st marriage I read a book. The first thing Stormie teaches you is to pray this, “Lord, change ME!” When I find myself focusing on someone I want the Lord to change, I go back to that prayer. Lord, change me! Amazing how He opens your eyes to them and places a different perspective in your heart for them. 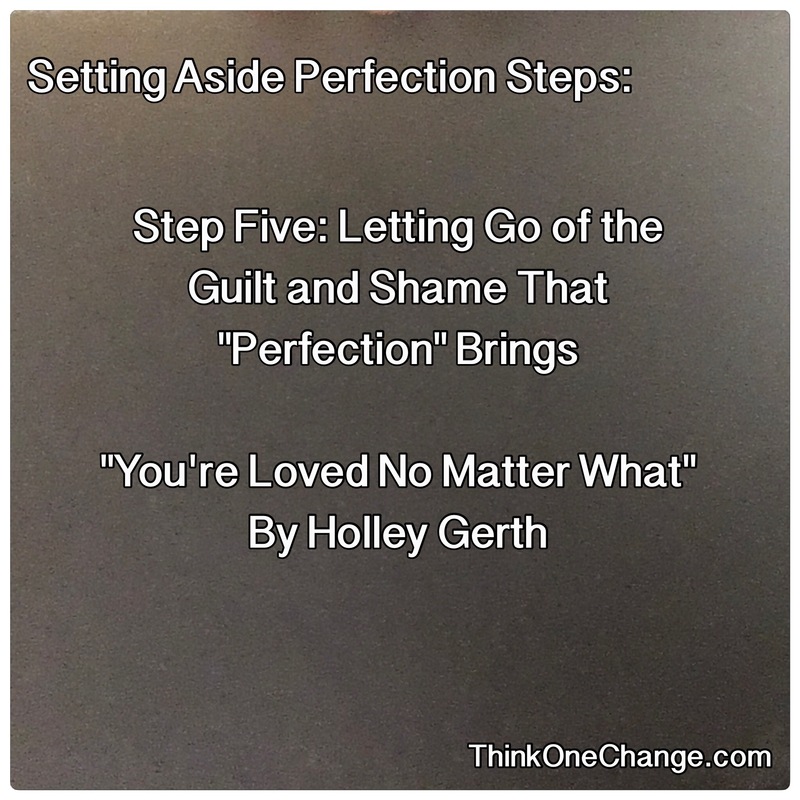 Step Five: Letting go of the guilt and shame that “perfection” brings. ~We can never go back and redo our past. All we can do is ask forgiveness (from the person and God). That person could be yourself by the way. When I focus on my past, I am not with Christ in the present. Hand it all over to Him because when He said, “It is finished” there was no going back for any of us. He took all our crimson sins out of our hands and replaced them with grace as white as snow. 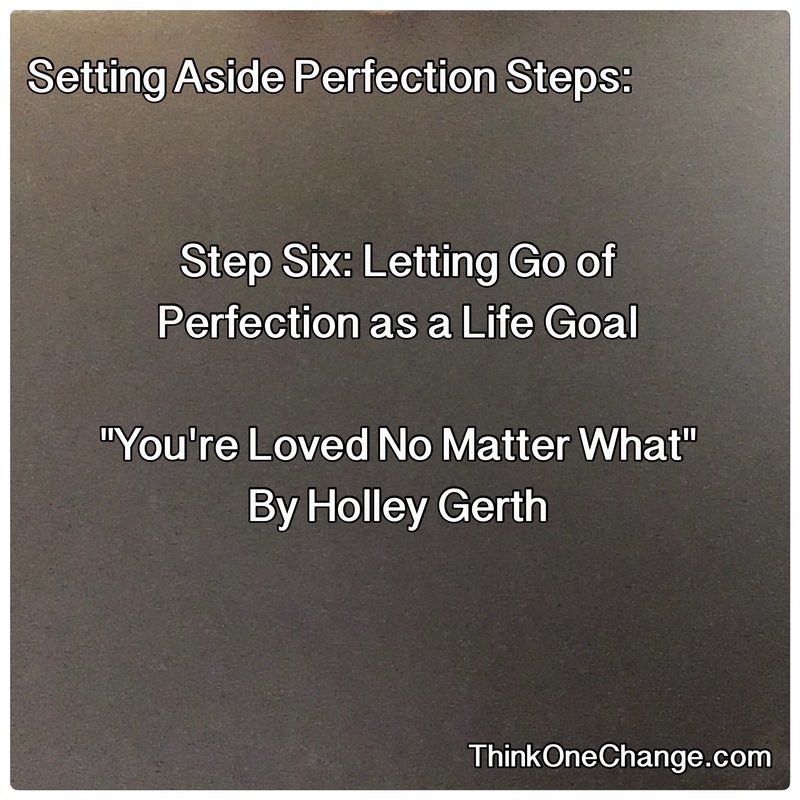 Step Six: Letting go of perfection as a life goal. ~When we focus on being perfect we may accomplish a lot of things. Who are we trying to be perfect for though? When we are motivated by being perfect for everyone we miss the most important thing in our lives. We miss out on the relationship and love we get from being with and in Christ! Stop being who “Fill In Name” would like you to be and be who He created you to be. Step Seven: Embracing what God has for you forever. ~There is only one you and He created you to be exactly who you are. When you put your focus on the relationship with Christ, you are living in love, with Him! You open yourself up to who you are supposed to be in Him, instead of focusing on what others want you to be. Live in Him, Live in Love. I still highly encourage you to write the note out to yourself on page 211. Put it on a sticky note, write it out on cards and address them to yourself so you can mail yourself one when you need some encouragement, still it in your prayer journal, and most of all just do it! Love each of you women! Headed to the doctor for my pre-op and prayed they could get Jack David in as well. Last week my nephew was diagnosed with strep. Jack David woke up feeling fine. He just had a small cough and a bit of a groggy throat. Thank goodness for our amazing office. I was all okayed for my surgery. Jack had no fever, and seriously looked great. However his rapid strep test came back positive. We talked a bit about our fruits, veggies and berries and she agrees that those are really helping him and probable have a lot to do with his odd diagnosis and symptoms. I can’t say for sure but hey maybe the next time he is exposed to it, he won’t even get it! So we went and got him an antibiotic and are also helping with Young Living essential oils. These are the days I am truly thankful that I am a stay at home mom who can work or can put it on the back burner. After we got home and pulled into the garage, Jack and I noticed a bag. We were not certain whose bag it was and so we just waited. About a hour after we got home, Kyle was knocking on the door. Apparently he has been released a day early, they put him in a cab and sent him here. Now fastforward to about 4:15 in the afternoon. My amazing Bella comes running, screaming and crying that she swallowed something and its stuck. Took about 7 minutes to get out it was a toy that was in her hand and then not in her hand but in her throat. She has no idea how it got there but it was stuck, it hurt and she was scared. After calling 911, the firestation arriving, getting her on O2 to get her stats up then the paramedics arrived. She finally got it to move. Now we have to wait for it to pass. Or I should say hopefully pass. If in a few days it isn’t noticed in the poo we have to take her in for an X-ray to make sure it isn’t stuck someplace, caused a rip, and the list of things goes on. My day has been very eventful. It has been fabulous though. I have been able to rely upon and give myself over to God a lot. I have been able to say thank you to Him for the things He has given us that has made this day go smoother than it could have. I was able to say thank you to Him for small thoughts I wouldn’t normally have, that lead to decisions I made, that made this day a LOT easier. How was your Thursday? Mine was eventful but I am so thankful that things are well tonight! These truly are the days I give thanks for being a stay at home mom. I can’t wait to hear about your day.